Most of the beers I brewed last year where somewhere dark. Nothing really lighter than an amber. 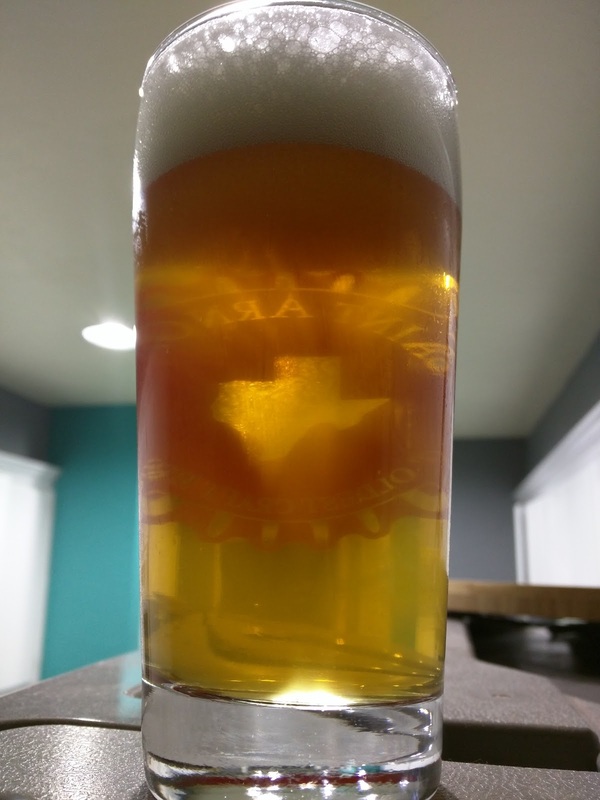 So by the fall, I was interested in brewing something a little lighter. 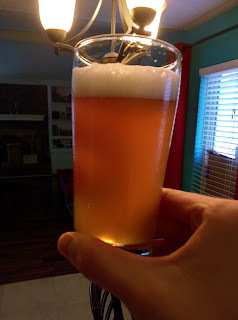 I ended up brewing a blonde ale based off of the very popular Centennial Blonde recipe (http://www.homebrewtalk.com/showthread.php?t=42841). I simplified the recipe a bit so I wouldn't have to measure anything too precisely, and the end result was enjoyable even to people who like the really light beers. Single infusion mash at 149F for 60 minutes. This was my first all grain batch where I actually hit my expected efficiency. The secret was campden treated city water. Brew day was nothing special otherwise. I was a little concerned with the fermentation though. It took a couple days before it started showing signs of life, but once the nottingham got going, it fermented it all the down. Towards the end of fermentation, after checking the gravity, I forgot to screw the lid all the way back on. Fortunately, it didn't hurt anything. I won't be brewing it exactly this way again. I will probably change up the base malts a bit; use some standard two row with the maris otter. Also, I might try to incorporate some cascade hops like the original recipe has. But all in all, it was great; something I will brew if I know (far) in advance that visitors will be drinking my beer. After the pictures are my notes. 10/17/2015: brew day. Used bigger mash bag, still kept anova directly in the water. Treated about 3.5 gallons of city water with campden. Strained out larger particles with fine mesh bag. Gravity after mash was brix 10.5. Gravity going into fermentor was 1.05. Starting fermentation at 60F. Hit the gravity properly. Recipe predicted 1.051 for 2.5 gallon batch size. It seems that the water was the problem. 10/22/2015: gravity is about 1.013. Removed from temperature control. 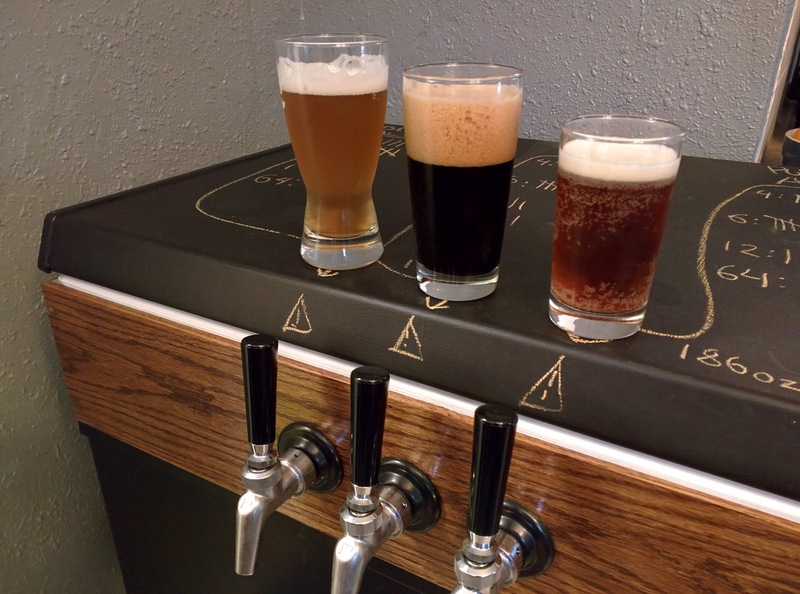 10/29/2015: kegged? Realized the lid had been mostly unscrewed since the last gravity check. Hopefully not screwed up too bad. Gravity was about 1.009. 11/19/2015: tasting. A little darker than I would have liked. A hazy golden color. Maybe it was oxidation? Floral smell with a hint of skunkiness and honey. Decent head retention and lacing. Fairly dry and crisp. Bit of sweetness perceived. Some breadiness in the flavor. Pretty good overall. 12/4/2015: tasting. Toast like aftertaste. Crisp, and it has cleared nicely. Hops contribute a slightly lemony flavor. Will be brewing again, maybe with different hops. Is a crowd pleaser though, as Joe likes it. 12/5/2015: keg kicked. 264oz served.